SCD Group: What’s Your Crisis Communications Plan? What do the recent high-profile events surrounding Penn State, Syracuse and Herman Cain have to do with you and your association or nonprofit organization? They demonstrate once again the need for all organizations to have a planned crisis communications plan ... that living document that tells everyone what to do when a crisis arises. And, make no mistake, you will face an unexpected crisis sometime. At last week’s meeting of the St. Louis Society of Association Executives (SLSAE) (http://bit.ly/pZ7Ssw), Tom Pagano (http://linkd.in/vlcOwa), senior VP of Fleishman-Hillard outlined the key steps organizations should have to deal with a crisis. Click this link for his full presentation http://bit.ly/uKoY7a. • When you are inside a courtroom, you are innocent until proven guilty. • When you are in the court of public opinion, you are guilty unless you prove yourself innocent. Clarify facts vs fiction: What do we know? When did we know it? What we are doing about it? As you build your own crisis communications plan, be sure to include who is responsible for what actions. Be sure you have a “phone tree” that allows the key leaders to know how to connect with each other. Have backup plans in the event that cell towers are down. 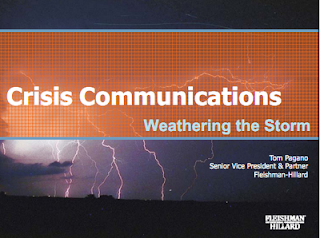 Does your organization have a crisis communications plan? Please send me a copy and I’ll create a catalog of plans for those who are interested.